This is what drummer Bill Bruford said about Mark Nauseef and Let's Be Generous in his November 1991 Wire Magazine interview: "Great drumming. This is where you'd hope Jimi Hendrix Experience would have got to. I have to say that it gets my blood going to hear Mark Nauseef rather than some of the older guys now. Five out of five." In his November 1992 Berkeley Weekly review, Henry Kaiser wrote: "If this is jazz, then it's certainly the most daring, original, and innovative jazz recording I've heard this year. 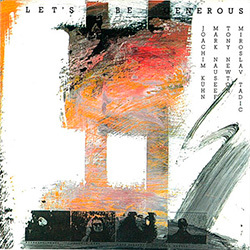 Mark Nauseef's Tony Williams vs. John French drumming, Miroslav Tadić's John McLaughlin meets Zoot Horn Rollo guitar stylings, Tony Newton's bass virtuosity and Joachim Kühn's incredibly peculiar, unfashionable, and distorted keyboard sounds all unite and create something that nobody has ever heard before."